Reliability Block Diagram (RBD), Fault Tree Analysis (FTA), Event Tree Analysis (ETA) and Bayesian Network have been said to be useful tools in the Safety and Reliability class. How reliable is this? Can we discuss if this is true. Permalink Submitted by Neil Fraser Jam... on Mon, 2012-11-26 08:08. Fault Tree Analysis; created in the 60’s FTA was developed for the air force and was applied extensively in the aeronautical sector to give a graphical representation of the reliability of a system to predict performance of elements and key poor performers that need further design and a good insight into overall life cycle cost of keeping a system available. The logical nature of the process allows a clear representation of the process primarily pin points any failings within the system that could cause complete failure without additional barriers in place. This is very important in the aforementioned industries as such a failure will have catastrophic results. The main advantage to using a FTA is that it creates relatively simplistic equations of probability to allow quantifiable analysis for comparison of different systems and components. FTA is of limited value on non-critical systems and systems with multiple states of failure or where the repair rates vary with the transient nature of failure, An example would be in the offshore industry where reconfigurations of systems that fail are possible it becomes overly complex and difficult to assess the importance of the time dependent reliability in situations like well control. Permalink Submitted by Neil Fraser Jam... on Mon, 2012-11-26 08:29. RBD is predominantly a graphical representation of Boolean logic, as far as reliability of RBD goes in my opinion it is only as good as the creator, the most important aspect of setting an RBD is an extensive knowledge of the components and the system requirements with key knowledge of the interactions between the functions of the system to create a visual map of the relationships to be formed. Utilising the quantifiable aspects of the RBD (MTTF, MTBF, MTTR) it becomes a very accessible tool for non-reliability engineers to devise SCE planning and analysis of the most effective PM regime for these components, also inventory required for spares and in turn adds a great deal of value in the planning and design stage of any system with a choice of components with different Cost Benefit analysis being possible dependant on the criticality in the system. Multiple states of failure are not accurately recorded in an RBD and this can alter the results of the analysis considerably and may require multiple RBD’s to be created causing additional difficulties and reducing the effectiveness of the tool. Permalink Submitted by Ikechukwu Onyegiri on Mon, 2012-11-26 10:42. Every equipment has modes of failure and an analysis of potential failure modes helps designers focus on and understand the impact of potential equipment failures and risks involved. This leads to achieving equipment reliability and prevent safety and environental hazards. As Neil mentioned about FTA it combines equipment failures and human errors that can result in the main system failure. FTA is a wonderful tool for failure assessment being that it identifies the faults/hazards first using a top-down approach (from hazards to causes). I will look at this topic from the constraints involved in this technique. First of all FTA development relies on the analyst's understanding of the system being analyzed. A ditch in understanding will result in a biased fault tree and as such biased response to fault troubleshooting. Also undesirable events must be foreseen and analyzed singly. FTA relies on anticipated contributors. For example when designing a FTA for an alarm relay system, significant contributors to failure can only include the ones that can be perceived by the designer (which is restricted to designer's understanding). Furthermore, each fault initiator must be constrained to two conditional modes when modelled in the tree and each initiators failure rate must be predictable (numerical risk evaluation needed). Applying all these constraints to a dynamic system might not properly model fault/failure in events where multiple modes counter-interact and play substitutional roles. So though FTA may reveal human error it does little to determine the underlying cause and is not practical on systems with large numbers of safety critical failures. In my view I'd say FTA is easy to read and understand, quickly exposes critical paths and can provide either qualitative and quantitative data for risk assessment porocesses as far as they are not too complex. In a complex system FTA could be used for a rough overview into faults, though commercial software applications have given FTA a wider application. Permalink Submitted by Ikechukwu Onyegiri on Mon, 2012-11-26 11:45. Under a topic like this raised by Ejimuda I would like to talk a little about a synergistic adaptation of FTA, Casual Factors Charting and ETA which gives birth to the Bow-Tie Analysis (also known as barrier diagrams). The Bow-Tie diagram is a structured approach to risks analysis within safety cases where quantification is not possible or desirable. It does this by linking hazards and consequences through a series of event lines pass barriers to develop incident routes. BTA comprises of steps such as: Identification of the top events with their hazards, Assessment of all potential threats and escalating factors, Identification of control easures to prevent hazard being released and Identification of mitigation or recovery measures. In industrial application BTA has found wide recognition due ti its incredible versatiliity as a failure analysis method in many successful applications such as : Logical Structured approach, Complete risk management. Hazrd demonstrations (e.g. in safety reports), Communication, Critical systems, Specific risks, Procedures and Competence, Organizational improvements and also Layer of Protection Analysis (LOPA). Every barrier relies on one or more activities carried out in industry to ensure its presence and effectiveness. Though BTA seems to be an industry leader whilst providing clear communication and improved understanding, recognizing greater ownership of controls and realizing greater efficiency improvements when compared to traditional methods I cannot say its the panacea for all risk management problems. BTA doesn't really on Boolean logic and also poses difficulty when linking to quantitative techniques as BTA doesn't quantify risk level in absolute terms diresctly. For example to design individual safeguards for every line of every section of every unit of your process facility HAZOP prefers a better solution than BTA. BTA is not the best solution when modelling complex inter-relationships between risk controls. For example if carrying out a failure analysis on an offshore main oil line pump, BTA will be appropriate to model a presentation which is easy to communicate, spot out efficiency gains such as benefits of pump being online and working optimally when required but wont be fully capture to what extent production will be altered if pump picks up slower than its intended to during start-up. I personally believe that BTA is still the best option the industry has got and with the use of commercial softwares limitations can be severed though I feel the effectiveness of methods for failure analysis is a solely dependent on acticities being modelled. Lessons Learned from Real World Application of the Bow-tie Method. Steve Lewis, 6th Global Congress on Process Safety, GCPS 2010. Permalink Submitted by Neil Fraser Jam... on Mon, 2012-11-26 12:04. I agree, Bow tie analysis is the front runner of Qualitive Risk Assessments and is incorporated into most safety cases however I would like to say that it isn’t really designed to fit into any of the reliability theory aforementioned, this is a participation tool to create a risk assessment based purely on the crew involvement in the running of the asset, showing any human factor inferences that need addressing and is really just a graphical indicator of the Swiss cheese model to make everyone aware of the criticality of barriers and mitigations to allow the optimum level of safety achievable , incorporated into BTA is the action review and recommendation tools allowing after review to the process and analysis of any improvements that may be required. Permalink Submitted by Olamide s Ajala on Mon, 2012-11-26 11:47. Event trees are inductive logic methods of identifying thevarious possible outcomes of a given initiating event, which outcomes depends only on the laws of science while fault trees analysis (FTA) involves interaction of many event using simple logical relationship to produce a top event. For FTA ,interaction of event is more of a deductive analysis once the structure of the event is put in place. To use these trees to accurately determine failure mechanism, one needs to be sound intellectually and understand the basic failure modes of the operation. Therefore the relaibilities or effectiveness of these tool depends on accurate human reasoning whether the operation is carried out manually or through the use of software which is prone to integrity issues. Permalink Submitted by c.ejimuda on Mon, 2012-11-26 18:07. Thanks to Neil on your explanation to FTA and RBD. If it is said that failure events in a system can be viewed logically from the RBD perspective and an event of a failure can be analysed systematically and painstakingly through FTA, of what use is combining the part in reality. Permalink Submitted by c.ejimuda on Wed, 2012-11-28 16:54. In my view after yesterday’s lecture, the FTA approach has the same logic similar to the RBD. RBD is used to show the success of a given system and the systematic connection of each component i.e. either in ‘series’ or in ‘parallel’ (redundancy) while the FTA is used to show faults or failure of a system. Illustrating this with an example. Let's consider a Dewatering system. Analyzing the success factor or probability of success of the Dewatering system. Constructing the Reliability Block Diagram below. Here we look at the different system components and analyze the success factor i.e. if Switch (S) is on, the probability that the Dewatering system will be successful depends on the success of the Pump (P) or water removal through Klaxon (K) and Bailing (B) is successful or both. Using Boolean logic to analyze the success of the Dewatering system, SnPnKnB or SnP or Sn (KnB) i.e. this component is to work for the Dewatering system to work. This clearly shows the failure or fault of each component that could bring down the entire system i.e. components S,P,K & B. The only problem I have with FTA is that no new information about the system is obtained and its as accurate as the designer. Can we comment on this. Clemens, PL. (1990) Event Tree Analysis 1990. Tullahoma, TN. Permalink Submitted by anasabdrahman on Fri, 2012-11-30 15:12. I do agree with aforementioned points. I would like to add on FTA, FTA itself is a qualitative method but quantitative evaluation could be derived from it . According to NASA’s Fault tree handbook with Aerospace Applications, the following usage of FTA for decision making is by giving a better understanding of events leading to top events. Thus, priority to contributors leading to top events could be address in order to devise a proactive steps in preventing the occurrence of the top events. In addition, FTA could also be utilized as a monitoring tool to monitor the performance of the system. On the other hand, it could also be use to manage resources by managing resources from an unimportant events and resources is shift in managing the important contributors events. It could also be used in assessing in system design process. This is achieved by looking at current system and events‘ reliability, thus, an alternative could device in mitigating such reliability issues. Lastly, it could also be used as diagnostic tool to identify and later mitigate the cause of top event or to simplified, as a tool in designing a preventive programs. In conclusion, the foundation of FTA are being used to fly us to the moon so to speak, thus, it goes to shows how effective and reliable it is not only in short term but also in long term in addressing reliability of system (including equipments etc) issue. Permalink Submitted by Dike Nwabueze C... on Mon, 2012-12-03 07:06. These tools are used effectively in modelling failure of equipment in network. The FTA (or HAZAN) provides a powerful and commonly used tool of a 'top down' procedure. It start from a 'top event' and goes down to all the possible failure modes of the equipment. It represents a purely logical system (AND, OR) containing no time element, either implicit or explicit. The ETA method of failure starts from the 'initial event' goes through the'engineered safety feauture' with either 'success' or failure' to arrive at the assessment. The RBD approach uses a block method to analyse failure modes with a parallel and series formation. The Bayesian network (BN) is a probabilistic graphical model, which represents knowlegde about an uncertain domain of events. The conditional dependencies in the graph of a BN are often estimated using known statistical and computational methods. Some of these tools are complex and requires high understanding of the user to effectively and successfully use it to predict failures. In general, I beleive they are effective in modelling system failures. Permalink Submitted by c.ejimuda on Tue, 2012-12-04 20:33. Having understood the theories and benefits of these methods from our discussions. Can we discuss their pitfalls with real life scenairos or examples. Permalink Submitted by YAKUBU ABUBAKAR... on Wed, 2012-12-05 06:19.
and the following are just few of them. can be very problematic and quite tedious. improve the overall reliability and that will add to the overall cost. any potential disaster to the environment. cost of its application and the increase in complexity to the system. Msc. Oil and Gas Engr. Permalink Submitted by RossWinter on Thu, 2012-12-06 10:15. The use of the aforementioned techniques is, in my opinion, very useful because you get a visual representaion of the system you are working with. This also means that if you want to improve the reliability of a system you can physically see where to change components. On the reliability of the figures calculated, then our calculations are only as reliable as the figures we are given initially, and this is the same for any other technique which uses these kinds of methods. Permalink Submitted by anasabdrahman on Sat, 2012-12-08 17:28. Its hard to give any example of real case study of FTA, RBD etc failure because this are tools to visualize and mitigate problems. The only failure in my opinion, will happen when this tools’ parameters are not well defined. On that note, it is not the fault of the tools but the human using it. In my last comment I did pointed out with reference towards its application (or example) in aerospace industry by NASA, this alone shows that the FTA is being use as a tool to identify critical system reliability and its success. In addition, I do agree with Mr Yakubu comment on its limitation but industries are moving into using software aids such as from isograph  and ptc  to name few of it. The only discussion we could concentrate is the failure of these software algorithm. There are also several adjusted FTA analysis is being implemented such as fuzzy logic to improve its reliability and implementation because what we learn in lecture is the fundamental of the analysis where as different industries will have different system/parameters. 3. Li, Y.F., Huang, H.Z., Liu,Y., Xiao, N., & Li, H. (2012) A new fault tree analysis method: Fuzzy dynamic fault tree. Eksplotacja I Niezawodnosc. Maintenance and Reliability Vol.14, No. 3 Pg. 208-2014. Permalink Submitted by Kelvin Osaro on Sun, 2012-12-09 12:17. 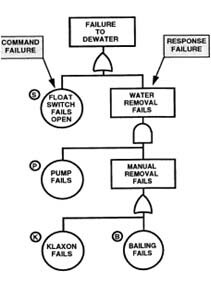 Fault tree analysis is considered as another technique in safety and reliability analysis as one of many symbolic "analytical logic techniques" found in operations research and in system reliability. FTA are logical block diagrams that display the top event in terms of basic event and are also a graphical design technique that serve as an alternative to the methodology of reliability block diagrams RBDs. Although, it is built from top to down and in terms of event rather than blocks, the graphical model of the pathways within the system leads to foreseeable and undesirable loss event or a failure. The standard logic symbols are (AND, OR etc) which the pathway interconnects contributory events and conditions. Hence, the events have an identical meaning as a block in an RBD and the gates are considered the conditions in fault tree diagrams . •It helps to show clear representation of logical process that can lead to system or sub-system failure hence, a clear qualitative representation of failure propagation. •It is considered as the most effective tool for fault isolation process. •It does not require high powered maths calculations for yielding quantitative analysis but relatively simple equations for probability of failure (Pf). The major drawbacks of using FTA are the difficulty to allow for transient and intermittent faults or standby systems with spares. The difficulty to represent systems where failure rates or repairs are state dependent and also if the system has many failure conditions, separate fault trees may need to be constructed for each one . Permalink Submitted by nina yari on Sun, 2012-12-09 14:58. I would like to discuss about Fault Tree Analysis and Event Tree Analysis which were taught in shell lecture and their Pros and Cons. for multiple events, multiple trees will be needed. Permalink Submitted by amaka.ikeaka on Tue, 2012-12-11 04:40.
and Mean Time To Repair(MTTR). Permalink Submitted by farahbod on Fri, 2013-01-25 23:13. Can anyone share how the output of FMEA is used in Fault Tree Analysis?